[8/31] Apple Announced New iMac G5 at Apple Expo Paris this morning in the keynote address given by Apple Senior VP of Worldwide Product Marketing, Phil Schiller. Schiller, who often assists CEO Steve Jobs with demos of Apple equipment at Macworld Expo's, delivered the keynote since Jobs is recuperating from surgery. Apple maintained the iMac as an all in one design built around a flat panel monitor. The new iMac G5 features the high-performance G5 processor and a stunning new design that integrates the entire computer right into the flat panel display. The iMac G5 packs a complete computer system into a mere two inches of depththe world’s thinnest desktop computer. The new line offers 17- or 20-inch active matrix widescreen LCDs and G5 processors running up to 1.8 GHz starting at just $1,299 stated the Apple press release. "Just like the iPod redefined portable digital music players, the new iMac G5 redefines what users expect from a consumer desktop,” said Philip Schiller, Apple’s senior vice president of Worldwide Product Marketing. “With the entire system, including a gorgeous 17- or 20-inch display, just two inches thin, a lot of people will be wondering ‘where did the computer go?" Built-in stereo speakers and microphone. Improved Address Book support. When selecting a person or a list of persons, it's possible to choose which address to use (e.g. "home" or "work"). Completely redesigned the Printer Calibration Process. Added the Scale setting that helps to solve the problem with cards getting slightly offset by the end of the printed page. Added nearly 25 new designs. Slightly redesigned the interface. Due to the new toolbar the app's appearance is improved. A full list of changes is available on this BeLight web page. [8/31] BBEdit 8.0 HTML and Text Editor Released: Bare Bones Software, Inc. announced the release and immediate availability of BBEdit 8.0, a major upgrade to its award-winning HTML and text editor. BBEdit 8.0 introduces over one hundred new features and improvements, including a new Documents Drawer and Navigation Bar interface, new Text Factories for automating text processing, numerous enhancements to the product's signature HTML markup tools, improved Unicode support, integrated support for Perforce, and much more. BBEdit 8.0 requires Mac OS X 10.3.5. Until the end of October, Bare Bones is offering BBEdit 8.0 for $179. Upgrades are $49-$59. A cross-upgrade is $129. When grouping updates by license, you can now choose between sorting by date and sorting by name. Added an additional icon set by Hartmut Hillmann to the “Extras” folder. [8/31] XtremeMac Announced Talking Panda iLingo, a Language Translator for iPod: XtremeMac announced the release of Talking Panda iLingo, a Language Translator for iPod (Mac/Win). Using the iPod's built-in Notes feature, iLingo equips the iPod toting traveler with over 450 essential words and phrases. Each translation is displayed on screen and, with the push of the play button, spoken aloud, making it easier to recognize and speak key words and phrases. CDW|MacWarehouse has fantastic deals on a wide assortment of essential products for your Mac, including the Kanguru 256MB FireWire Fire Flash Drive, Canon i80 Bubble Jet Printer, Microtek ScanMaker 9800XL, Roxio Toast with Jam 6, Orange OrangeLink FireWire 800, Iogear USB 2.0/FireWire Combo Card, Epson Stylus Pro 1280 Color Inkjet Printer, Griffin Technologies iTrip mini FM Transmitter for iPod mini, and much more. [8/31] New Wallpaper Designs for New Apple Displays Include 30" Model: PlasmaDesign released an additional 10 high quality desktop backgrounds designed for use on Apples new range of flat panel displays. Each image is available in resolutions of up to 2560x1600 ensuring a highly detailed and crisp appearance across all three sizes of monitor; the 20 inch, 23 inch and the new 30 inch HD Displays. This new collection of 33 wallpapers, along with a further 130 high resolution images are available to members of PlasmaDesign. [8/30] Apple Expo in Paris Begins Tonight or very early Tuesday morning EDT-PDT depending on one's perspective. Apple CEO Steve Jobs has been recuperating from surgery so, according to news reports the Paris Expo's keynote address will be given by Phil Schiller, the Apple VP who frequently joins CEO Steve Jobs on stage during Macworld demos of new Apple hardware. There is speculation that Schiller may show off the new iMac G5 that was more or less announced in a message from Apple on the iMac page of The Apple Store. The message states that the new iMac will be announced and available in September. The fact that the new iMac will sport a G5 CPU was divulged during the webcast press conference on Apple's third quarter financial report in July. The form factor is rumored to be an all-in-one LCD. That sounds cool to us but hasn't that already been done by PC makers? We're sure that an Apple rendition would be much better but we remain hopeful for a more innovative form, like an under $1000 keyboard with VGA and DVI ports that can use either Apple's terrific new display line or a cheap CRT. Stay tuned this week for the news from Paris. [8/30] Apple Posted Workgroup Cluster for Bioinformatics Movie: Computing with a cluster of computers continues to expand, economically bringing tremendous computing power to all. Apple produces a slick turn-key cluster computer from its Xserves. A QuickTime movie on Apple's Workgroup Cluster for Bioinformatics is located on this Apple web page. [8/30] From the Dark Side--HP Announced "Apple iPod + HP" Among Its New Consumer Products: Except for their HP logo, the HP-branded 20 and 40 GB iPods are identical to Apple's iPods right down to the color, accessories and MSRP of $299 and $399. Check them out on this HP web page. The Windows version of iTunes is bundled with each HP computer making it easier for the Wintel crowd to use Apple's iPod and iTunes Music Store. This worldwide exposure via the number two computer manufacturer should do Apple some real good. [8/30] From the Dark Side II--Longhorn De-Horned as M$ Excised Features to get it out the door by the end 2006. The shortened Longhorn is Microsoft's "revolutionary" operating system that will replace the 3-year old Windows XP. The feature drops were announced by M$ on Friday. The major feature dropped is called WinFS, a database-type file system with complete search technology. WinFS will be in beta testing when Longhorn ships so it will be a year or two before the feature is added. Of course, Mac OS X 10.4 "Tiger" will sport an instant and complete search feature called Spotlight when it debuts early next year, two years aheaad of the shortened Longhorn and three to four years ahead of WinFS. O'Reilly has exclusively Hot Deals discounts for many of it's most popular Mac titles, including "iMovie 4 & iDVD: The Missing Manual," "iPhoto 4: The Missing Manual," "Adobe Photoshop CS One-on-One," "Running Mac OS X Panther," "Leaning Unix for Mac OS X Panther," and much more. <- Buddy List window no longer disappears - Address Book no longer disappears - having File Vault enabled no longer breaks application - you can be "selectively away"; manually IMing some while iJames handles the rest. - existing chat windows are not closed unless you request. - missed messages can now be stored or viewed several different ways. All is all. This is a MORE mature release. I do believe the app is much more usefull and less encumbering now. ENJOY!" * Corrected reported issues with eDrive creation. * Corrected reported Directory Maintenance issue. * Corrected Wipe Data routine while booted from eDrive. * Corrected reported Finder Info issue. * Enhanced support for PowerPC G4 7447 testing and detection in Processor test. * Enhanced support for PowerPC G5 970FX testing and detection in Processor test. * Updated Video Memory test to detect Radeon 9800 XT. * Enhanced Optimization routines for more thorough pre-flight checks. * Allowing Directory Maintenance/Optimization on one volume at a time while booted from CD. * Added TechTool Pro 4 Help Italian localization. * Added Safari web browser to the eDrive volume. * Added dialogs for Data Recovery routine during scavenge routine. * Corrected localization issues for French version. * Global updates for new machines. * Added French, Italian and Japanese localization versions. * Additional support for third party ATA PCI cards. * Enhancements to Wipe Data feature. * Enhancements to File Structure and Finder Info tests. * Enhancements to Directory Maintenance and Optimization features. * Enhancements to Data Recovery feature to find data on volumes with bad blocks. * Improvements to Diagnostics Setup feature. * Improvements to Volume Structure detection and repair routines. * Additional support for eDrive creation routine. We posted a Hands-On Review of TTP 4.0.1 on December 4, 2003 and liked it, except for problems booting from the 4.0.1 CD - several iterations needed before it would boot and overly long delays after startup commenced. In collaboration with the MM technical staff, we subsequently determined the problems lay with the version of Panther 10.3 on the CD that Apple licensed to developers, not with the application itself. The boot problem went away with the issuance of the TTP 4.0.2 CD which included a developer version of Panther 10.3.2. We reviewed TTP 4.0.2 on March 19 this year and thought subjectively that it ran faster than the initial release. We downloaded TTP 4.0.3 updater on two machines, a 1GHz G4 Cube, which is the machine on which we ran the prior versions, and a Tangerine original iBook which we recently upgraded with an 80 GB hard drive. This is the first TTP 4 updater we have downloaded. The TTP 4.0.2 update was initially available only by CD; MM later posted a download updater. We downloaded and ran the updater on both machines successfully. We have some observations. As we have previously noted, a significant feature of this application is its ability to run from a so-called eDrive which is installed from the CD only on a separate 4 GB partition. Having the application reside on one's hard drive is primarily to facilitate booting into the eDrive which is normally invisible on the desk top. This is counter to other disk utilities with which we are familiar, when one has to boot from a CD in order to run a disk utility to test hard drives and repair problems. MM in fact doesn't recommend booting from the TTP 4 CD except in emergencies. [Since our last review MM has posted more information on its FAQ web page about when and when not to boot from a CD to use TTP4.] It also means that one needn't buy or burn a new CD each time the application is revised, if the eDrive application can be updated. But, if the TTP4 application that is most important resides on the eDrive and the eDrive is invisible on the desk top, would an updater that downloads to the hard drive update the eDrive? Answer: Yes. In fact, the updater is quite intelligent. It found both the eDrive and the hard drive application folders and asked that one be selected for updating. On one machine we selected the eDrive application first. After completing the update successfully, the updater asked if there was another TTP4 application to update. With a "Yes" response, the updater found the added app on the hard drive without further help. We tried the selection process in reverse on the second drive; the procedure worked the same. After updating both applications, we told the updater it wasn't finished to see if it would try to update again. It didn't. Instead it advised that all applications had been updated. If you loose track of whether you have updated both applications, just keep trying until the updater itself signals completion of all tasks. We then ran the updated application on the Tangerine iBook . While it ran somewhat slowly - understandable since the Clamshell has only a 300 MHz G3 processor which might be offset by our new hard drive having only 2.3 GB of data on it - it was not deathly slow and completed its assigned tasks in good order. If you already have a prior version of TTP 4 on your hard drive and eDrive, we recommend the updater. [8/27] Micromat's TechTool Pro v4.0.3 Update is Out and available from MacUpdate.com. Also available (scroll down on the MacUpdate page) is v3.0.3 for the AppleCare edition of TechTool. There are many important fixes to v4.0.2. [8/27] Griffin EarJam iPod Earbud Bass Boosters Announced: Griffin Technology Inc, today announced the Griffin EarJams. The Griffin EarJams are a totally new kind of product  they snap onto your iPod’s existing earbud-style headphones and significantly increase the bass output, volume level and comfort. The EarJams turn your existing earbuds into in-ear style headphones. A sonic enhancing cone extends the sound directly into the ear and is protected and made comfortable by slip-on soft ear pads. Three sizes of removable pads are included for the perfect individual fit. The package also includes a small canvas carrying case. The new Griffin EarJams will be shown Tuesday at Apple Expo Paris and will ship in September for just $19.99. [8/27] Engst and Leonard Tonight on The Mac Night Owl LIVE! Internet Radio Show: This week, Gene and Grayson Steinberg will have a long talk with Adam Engst, publisher of TidBITS and author of the new eBook, "Take Control of Buying a Mac." We'll also hear from Chuck Leonard of DVForge, formerly MacMice. Tune in from 6:00 to 8:00 PM Pacific, 9:00 to 11:00 PM Eastern. Brand new, and exclusive to the Apple Store is the inMotion iM3 Portable Audio System from Altec Lansing.This tiny, ultra-portable, battery-operated stereo system has been designed for the iPod, and supports all iPods. A highly efficient amplifier powers four full-range micro drivers to deliver a full spectrum of pure, distinct sound, while the revolutionary MaxxBass(R) technology allows listeners to enjoy deep bass without lugging large speakers around. Best of all, connectivity is as easy as placing your iPod into the built-in dock or connecting it through the auxiliary port. Sold exclusively at the Apple Store. Sweetwater has fantastic deals on essential music and audio products for your Mac, including the Tascam US-122 2-Channel USB Audio/MIDI Interface with TRS and XLR Inputs, Ableton Live 4, Studio Projects B1 Studio Microphone, Bias SoundSoap, M-Audio Studiophile BX5 Reference Speakers, Spectrasonics Atmosphere, Etymotic ER-6 Earphones, and much more. Amazon has money savings deals on great Mac products, including Readiris Pro 9 OCR Software, Roxio Toast 6 Titanium, ProSoft Picture Rescue, Miraizon Cinamatize, ProView PL456S 14" LCD Flat Panel Display, Canon i960 Photo Printer, Intuit Quicken 2005 Deluxe for Mac, Symantec Norton AntiVirus 9.0/Norton Utilities 8.0 Bundle, and much more. Publishing Perfection has great deals on publishing products for your Mac, including DAZ Victoria 2.0, Curious Labs Poser Artist, Total Training Graphic Essentials Bundle, AutoFX Photo/Graphic Edges 6.0, Digital Anarchy Texture Anarchy, Adobe Creative Suite Standard Upgrade, Epson Perfection 3170 Photo Scanner, Markzware FlightCheck Pro 5.5, and much more. "With a score of 81, Apple's customers are the most satisfied of any other PC vendor measured in this index. Apple's success comes from a focus on innovation and improving tech support...."
We previously noted that Consumer Reports also rated Apple the highest among PC manufacturers. [8/25] Free Envision Web Show of the Week Posted: This week's Envision Web Show of the Week continues the Olympic theme. Based on the Yahoo Sports site, the "Olympics" show includes recent photos from a wide range of events. The show automatically updates itself once a day, so you'll always have up-to-date photos. The show file can be downloaded from the Show of the Week web site. Previous Shows of the Week are available in the Show of the Week archive. [8/25] AssisitiveWare Demos New and Updated Apps at Apple Expo in Paris Next Week: AssistiveWare announced that it will show a number of upcoming assisitive technology product releases at the Apple Education booth of the Apple Expo (Paris, 31 August - 4 September). New versions will be shown of KeyStrokes on-screen keyboard, SwitchXS switch access solution and a completely new, multilingual speech product called Proloqu. KeyStrokes 3.2, SwitchXS 1.6 and Proloquo 1.0 are expected to be released in October. [8/25] Apple Mac OS X Server Admin Tools 10.3.5 is Out and available for download. It only installs on Mac OS X Server 10.3.x. [8/25] From the Dark Side--Browse Happy, Dump IE: Kick the M$ Internet Explorer habit. A new campaign from the Web Standards Project (WaSP) named "Browse Happy" has the goal of convincing people to dump Microsoft's Internet Explorer. It encourages people to use alternatives like Mozilla, Firefox, Opera and Apple's Safari according to this CNet article. WaSP cited recent recommendations by the U.S. Computer Emergency Readiness Team--a computer security partnership between the U.S. government's Department of Homeland Security, the public sector and private sector--against using IE because of its security problems. Brand new, and exclusive to the Apple Store is the inMotion Portable iPod mini Speaker System from Altec Lansing. This tiny, ultra-portable, battery-operated stereo system is the first powered audio system designed for the iPod mini. ClubMac has fantastic deals on a wide variety of products for your Mac, including MacSoft's Neverwinter Nights: Hordes of the Underdark Expansion Pack, Planar 17" LCD Flat Panel Display, Canon EOS 10D Digital SLR Camera, Alien Skin EyeCandy 5, Dr. Bott Bird's Ezison Speaker System for iPod, Epson PictureMate 5760 Personal Photo Lab, Feral Interactive Republic: The Revolution, and much more. B&H has great prices on photo and video products for your Mac, including Nik Multimedia Dfine 1.0 Image Editing Software, Olympus C-8080 Wide Zoom Digital Camera with 512MB xD Picture Card, Epson Stylus Photo R300 with FREE 100 Sheets of Premium Glossy Photo Paper, Canon ZR-90 MiniDV Camcorder with Accessory Kit, Hewlett Packard PhotoSmart 7760 Photo Quality Inkjet Printer, and much more. [8/24] Nanosaur II Hatchling Update v1.0.7 is Out and available for download from Pangea Software. Nanosaur is one of our all-time favorite computer games. The sequel, Nanosaur II, is even better. We clicked the eUpdate button and a new set of virus definitions downloaded and installed. Get the free Flash Video Kit (a $99 value) when buying or upgrading to Studio MX 2004 with Flash Professional and register it online by September 30. We stayed at Holiday Inn Express during the move of Macs Only! 's global HQ across country because most are relatively new and inexpensive and advertise free broadband internet and Wi-Fi. We encountered one (Las Cruces, NM) that did not have broadband or Wi-Fi and one (Scottsdale, AZ) with Cisco equipment that would not allow Mac access, wireless or wired, despite the advertising. [8/24] MacTracker X v3.0b1 is Out and available for download via MacUpdate.com. Mactracker provides detailed information on every Apple Macintosh ever made, including items such as processor speed, memory, upgrade, and expansion options. 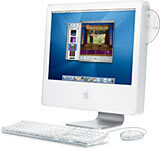 Also included is information on Apple monitors, printers, scanners, digital cameras, Newtons and versions of the Mac OS. Apple iTunes remains the easiest way to rip, organize, play, and buy digital music. Check the "Next General Meeting" page for details. WAPi is the greater Washington DC AMUG and one of the oldest. The Apple Store has once again updated it's selection of top-quality Apple Certified reconditioned products and Sale-Priced products. Apple Certified iPods start as low as $169, with PowerMacs, PowerBooks and several other products available at great prices. But, hurry as supplies are limited. You can now also find current Promos and Rebates on Apple hardware and software, as well as third-party accessories in the Special Deals section of the Apple Store. All details available under the "Special Deals" tile. CDW|MacWarehouse has great deals on cool Mac products, including the Griffin iTrip FM Transmitter for iPod mini, Belkin 3-port FireWire Hub, Canon LiDE 80 Flatbed Scanner, Viking 512MB RAM for PowerBook G4, VST/SmartDisk Technologies FireLite 80GB External FireWire Hard Drive, Sonnet PodFreq Transmitter, Samsung SyncMaster 91OT 19" Flat Panel Display, and much more. MacZone has fantastic prices on essential Mac products, including Wacom Intuos2 Platinum 6"x8" Graphics Tablet, Allume Systems StuffIt Deluxe 8 for Mac, Keyspan USB to 2-Serial Port Adapter for Mac, Epson Stylus Photo R300 Color Inkjet Printer, Aspyr Media James Bond 007: Nightfire, Fuji CD-R 48x 80min 700MB 100-pack Recordable Media, and much more. CompUSA has money saving deals on a bevy of Mac products, including Sony's HS73/BT 17" LCD Flat Panel Display with $50 mail-in rebate, Iomega Zip 250MB USB Drive with $30 mail-in rebate, Epson Stylus C86 Color Inkjet Printer with $20 mail-in rebate, Roxio Toast and Jam 6 with $30 mail-in rebate, Epson Perfection 3170 Flatbed Scanner with $25 mail-in rebate, and much more. [8/20] Yale Daily News Produced with Macs: From Power Mac G4s to iMacs to Power Mac G5s and Xserves, the staff of the Yale Daily News turns out their publication without a hitch or dedicated support staff according to this Apple Education news item. The Yale Daily News is the oldest college daily newspaper. [8/20] Brief Hands-On Report--MacUpdate.com Released MUMenu v2.0 for Immediate Software Update Notices: Joel Mueller runs a great free software update service at MacUpdate.com. His free software, MUMenu, places an icon in your Mac's menu bar that, when clicked, drops a menu listing the most recent additions to MacUpdate.com. The default icon even automatically turns golden when new updates have been added. On 7/11/2002 we favorably reviewed Joel's 1.0 version of MUMenu for Mac OS X. He just released MUMenu v2.0 with some substantial improvements. You can now specify your own menu bar icons by simply dragging them to the respective image wells in MUMenu's new preferences window. Improved MUMenu's way of checking for updates. This results in a smaller network bandwidth footprint. You can now force MUMenu to check for updates by double-clicking on its application icon. This also works by relaunching MUMenu via hot key. Just use your favorite hot key utility to assign a hot key to MUMenu. Removed the option to search MUMenu for the current clipboard contents directly from MUMenu's pop-up menu. Instead, the "Search MacUpdate.com..." input field will default to your clipboard contents if these appear to be applicable. We uninstalled MUMenu 1.x and Menu Extra Enabler, then downloaded and installed MUMenu 2.0 by just copying the application to our Applications folder. Upon launching MUMenu an icon appears in the menu bar with a drop down menu listing available software updates. One can also use the preferences to set MUMenu to launch automatically at log in. The new interface is cleaner. "Major" updates are now highlighted in red on the menu list instead of having a dash in front of the listing. The preferences allow one to set the frequency of automatically updating from every 30 minutes to every 3 hours. MUMenu 2.0 can be forced to update by double-clicking its application icon (not the menu icon). One can also set the MUMenu 2.0 icons by dragging and dropping images into the "regular" and "updated" image wells in the preferences. With several hours use, MUMenu 2.0 seems to work every bit as well as the previous versions and with less bandwidth usage. Aside from getting direct email from software authors or Apple Software Update preference pane, MUMenu is usually the first place we learn of the existence of new software updates. We think you will like it. [8/20] Free Wingnuts Game and Discount on AirBurst Extreme Game for .Mac Members: The folks at Freeverse have a special offer for .Mac members that includes a free copy of the game Wingnuts, a nice salute to the top-down scrolling arcade machines of the '80s. You also get a 25 percent discount on their new AirBurst Extreme. The follow-up to Game Hall of Fame member AirBurst, AirBurst Extreme is an original mix of the paddles and balls of Pong and Breakout into something altogether fresh and fun. [8/20] Apple Instituted Safety Recall/Exchange Program for Some 15" PowerBook G4s: Yesterday, Apple and the Consumer Product Safety Commission jointly issued a recall notice for some batteries shipped with aluminum 15" PowerBook G4s. The recall was issued after Apple received four notices of overheating batteries, none resulting in injuries. The batteries in question were built by LG Chem of South Korea and may short out causing overheating. Apple warns that anyone with a suspect PowerBook battery stop using it immediately, notify Apple and receive a new battery in exchange by mail. Apple has set up a web page with information on the issue, how to identify suspect batteries and how to exchange a suspect battery. Apple will ship a new battery before requiring the old one to be shipped back to Apple. [8/19] Aspyr Media Introduces Free Game Night on Fridays at Some Apple Stores: You know how you like to test drive a car before buying it? Game Night gives you the chance to "test drive" some of the latest Mac games, and learn some insider tips and tricks. With the number of Apple stores increasing seemingly exponentially around the country, Aspyr decided to get in on the action and has begun a new partnership with the retail outlets--they provide the hardware and Aspyr provides the software. Several Apple stores are hosting a Game Night every Friday from 7-9 p.m. Experience the latest and greatest games for the Mac. For you lucky folks down here in Austin, TX, an Aspyr representative will give a short presentation on some of the latest games for the Mac on the third Friday of every month followed by the FREE GAMING SESSION. If you are in the Austin area, come out this Friday, August 20 at 7 p.m. to learn about some of Aspyr's exciting, soon-to-be-released games and enjoy your chance to play MTX: Mototrax, the most complete motocross game yet. The following list gives contact info for some of the participating stores. Check with your local Apple store to see if they host a Game Night and which games will be featured each week. [8/19] Bill Atkinson and Owen Linzmayer Spoke at August Stanford/Palo Alto MUG: Everyone should know that Bill Atkinson was a member of the original Macintosh design team and that Owen Linzmayer has chronicled Steve Jobs and Apple Computer from their earliest days. Now the two have something else in common: they both spoke at the Stanford/Palo Alto MUG's August 2nd meeting. A summary is available on the S/PA-MUG web site. J&R has fantastic deals on essential products for your Mac, including The Sims: Makin' Magic Expansion Pack, Eagle Games Tournament Poker: No Limit Texas Hold 'em, Epson Stylus CX6400 All-in-One Device, Micromat TechTool Pro 4, Microsoft Office 2004 Student and Teacher Edition, Panasonic PVG-555 MiniDV Camcorder, Roxio Toast 6 Titanium, Symantec Norton Utilities 8.0.1, and much more. [8/18] New Envision Web Show of the Week from Open Door Networks is Out: This week's Envision Web Show of the Week features impressive pictures from Athens, Greece, where the Summer Olympics are underway. Focusing on the Acropolis and the Parthenon, the show file can be downloaded from the Show of the Week web site. A Show of the Week archive has also been established which will maintain and document past Shows of the Week. [8/18] Jumsoft Released Process 1.0: According to Jumsoft, Process 1.0 for Mac OS X elevates outlining applications to a new plateau by seamlessly linking projects with the elements needed to complete themall with single-window simplicity and a user-friendly Aqua interface sure to please. Process is $25 shareware. [8/18] Aspyr Media's August Game Report: During the first six months of 2004, Aspyr has shipped a range of great titles. Video gamers come in varied ages, with an array of likes and dislikes, and these games have covered the gamut of their interests. There are big-name shooter titles like Battlefield 1942 Deluxe Edition, Call of Duty, and Delta Force: Black Hawk Down, stealth and intelligence in Tom Clancy's Splinter Cell (coming soon) and Command & Conquer Generals, intense and exciting sporting games in the Adrenaline Sports Pack, and games that all ages can enjoy like Shrek 2: The Game, Spider-Man 2: The Game and Space Colony. Star Wars: Knights of the Old Republic throws you into a galactic war between the Jedi and the Sith. SimCity 4 Rush Hour expansion pack allows players to take control of their city's transportation with a wide variety of new options. [8/18] From the Dark Side--Wintel News of Interest: We haven't posted our column that usually takes jabs at the Wintel world for some time. Here are items of interest to Mac users. [8/17] Apple Motion Subject of Special Apple Store Demo Event August 25th: According to Apple, Motion is the only motion graphics package with real-time previews, procedural behavior animation and Final Cut Pro HD integration. Apple’s high-performance motion graphic design and production application lets you explore new creative territory using self-propelled behavior animation, character-by-character title animation and a powerful new interface. Motion integrates seamlessly with Final Cut Pro HD and DVD Studio Pro 3, making it quicker and easier than ever to create motion graphics for film, video and DVDs. Motion sells for $299. Discover Motion on August 25th at an Apple Store or an Apple Authorized reseller. Discover Motion is a special event highlighting Apple’s new motion graphics package with real-time previews and procedural behavior animation. See for yourself how Motion can take your motion graphics to all-new levels. I've just released the conceptual beta of my first public application "iJames Away Message". It gives iChat users the ability to set up custom auto-response messages for any of your buddies. AudioMIDI has fantastic deals on a wide range of audio products for your Mac, including Native Instruments B4, M-Audio Keystation Pro 88, Bias Peak 4.1 Mastering and Restoration Edition, Stanton Final Scratch Pro 5.1, Echo Indigo/Shure E2 Earphone Bundle, M-Audio Studio Bundle, Glaresoft iDrum for GarageBand, Behringer BCF2000 B-Control Fader, and much more. [8/17] ATI Introduced Radeon 9200 PCI Graphics Card for Power Macs with a PCI slot. Here are the specs. It drives two displays simultaneously with independent resolutions and refresh rates and has VERSAVISION that provides hardware accelerated display rotation and scaling. The Radeon 9200 also has 128MB DDR memory, Dual Integrated 10-bit per channel 400MHz DACs, Integrated TV-Out and DVI-I, VGA and S-Video ports. It's believed to cost just over $100. [8/17] Apple Introduced Production Suite Last Week: Production Suite, according to Apple, is the essential software suite for film and video that delivers real-time production tools in one comprehensive and integrated package. Production Suite combines Final Cut Pro HD, the latest version of Apple’s Emmy award-winning editing software; Motion, a revolutionary new application that redefines motion graphics; and DVD Studio Pro 3, the latest version of Apple’s professional DVD authoring application. Production Suite provides creative professionals with an integrated round trip production environment where media and project files move seamlessly throughout the creative process. Production Suite is available now for a suggested retail price of $1,299. Multimedia is second nature to them. To design and create a documentary of professional quality is all being realized through programs provided by the MLTI (Maine Learning Technology Initiative). Skowhegan Middle School sent a number of students on to Washington, D.C., in June with incredible documentaries on such topics as the space race, flight and civil rights issues. This is the fourth year students have competed at National History Day and school itself, (and have) taken first place overall at the Maine competition. [8/16] Washington Apple Pi's Sept-Oct Tutorials: WAPi has completely revised their Mac OS X New User class series and added an additional optional class, "How to Get Connected to the Internet." Look for additional classes and changes in the next WAPi Journal. Between Journals, be sure to check the Pi calendar, the TCS, and the WAPi Electronic Newsletter for additional classes and information. Washington Apple Pi is the Greater DC AMUG, one of the oldest in the Nation. The Apple Store has updated it's selection of quality Apple Certified reconditioned products and Sale-Priced products. Apple Certified iPods start as low as $169 with PowerMacs, PowerBooks and several other products available at great prices. But, hurry as supplies are limited. You can now also find current Promos and Rebates on Apple hardware and software, as well as third-party accessories in the Special Deals section of the Apple Store. CDW|MacWarehouse has great deals on top quality Mac products, including Intego VirusBarrier, VST/SmartDisk FireLite 80GB External FireWire Hard Drive, Iogear 3.5" Combo ION 200GB USB2.0/FireWire 800 External Hard Drive, Samsung SyncMaster 910T 19" Flat Panel Display, Sony DCR-HC85 Mini DV Camcorder, Netopia Timbuktu Pro 7, Hewlett Packard OfficeJet 4215 All-in-One Device, and much more. O'Reilly offers exclusive pricing to Hot Deals visitors on many of its most popular titles, including "Running Mac OS X Panther," "Learning Unix for Mac OS X Panther," "Office X for Mac: The Missing Manual," "Mac OS X Unwired," "Mac OS X: The Missing Manual, Panther Edition," and much more. Inside Mac Games has great prices on the hottest games for your Mac, including Harry Potter Deluxe Edition, Neverwinter Nights: Shadow of Undrentide Expansion Pack, Neverwinter Nights: Hordes of the Underdark Expansion Pack, Republic: The Revolution, Victoria, Shrek 2, Medal of Honor: Deluxe Edition, and much more. would be deemed to be commercial. appear at or near the beginning of the message. is to advertise or promote a product or service. Do they do it for you? Let the FTC know (scroll down). The final rule is expected out in December. [8/14] Apple Safari v1.0.3 for Mac OS X 10.2.8 is Available for download. It also appears in the Software Update preference panel if one is running 10.2.x. [8/14] Apple Compressor Update v1.2.1 is Available for download from this Apple web page. According to the Read Me, Compressor provides automated media encoding to give you the highest quality MPEG for DVD authoring or for streaming to wireless devices. Now optimized for Power Mac G5 and Mac OS X Panther, Compressor 1.2 delivers 55% faster encoding over Power Mac G4. iPod Updater 2004-08-06 includes iPod software 3.0.1 for iPods with a Click Wheel. iPod Updater 2004-08-06 contains the same software versions as iPod Updater 2004-07-15 for all other iPod models. [8/13] MacWireless 11g High Power Access Point is Now Shipping: Offering 200 mW of output power (6 times that if the AirPort Base Stations), the MacWireless 11g High Power Access Point (AP200) has the signal strength to take your wireless network to the farthest corners of your building according to MacWireless. The AP200 costs $199. PPoE is not supported. [8/13] Dr. Mac and Ken Case on Tonight's The Mac Night Owl LIVE: This week, hosts Gene and Grayson Steinberg will feature Bob "Dr. Mac" LeVitus, author of "GarageBand for Dummies" and over 45 other Mac books. We’ll also discover OmniWeb 5.0, the newest browser from OmniGroup with CEO Ken Case. You can tune into the broadcast from 6:00 to 8:00 PM Pacific, 9:00 to 11:00 PM Eastern. An archive of the show will be available for listening at your convenience within eight hours of the original broadcast. [8/13] Griffin Debuts RoadTrip, a 3-in-1 Transmitter, Charger and Cradle for all iPods: Griffin Technology Inc. announced the Griffin RoadTrip, an all in one iPod charger, FM transmitter, and cradle in one compact unit. The Griffin RoadTrip allows you to play your iPod or iPod mini’s music through your car’s FM stereo, while simultaneously charging and positioning the unit for easy access. The RoadTrip also features a detachable Transmitter Module and cable that can broadcast users’ Mac or PC music to any FM stereo. The new Griffin RoadTrip retails for $79.99 and will begin shipping September 1. Customers can also preorder a RoadTrip soon at the Apple Store. [8/13] iChat2Cell 1.0 Released by If Then Software: iChat2Cell is a utility that will simplify sending SMS messages through iChat. With the current way iChat allows you to send SMS messages to cellular phones, you have to first bring up a new invitation window (because Address Book doesn't save cell numbers as buddies), then you have to enter the country code and "+" and then you can finally send the message. With iChat2Cell, all of those steps are taken care of with one simple application. iChat2Cell is donationware, i.e. with a donation to If Then Software, they will send a code to unlock the built-in address book which makes it even easier to keep track and send SMS messages to your favorite cellular users--all through iChat! Tested with Mac OS X 10.3 and higher. [8/13] Keyspan's Digital Media Remote Drivers v1.7 are Available for download via MacUpdate.com. Keyspan's Digital Media Remote controls applications like PowerPoint on your Mac using an infrared signal. We have one and works simply and very well. Amazon has fantastic deals on essential Mac products, including the Canon i860 Photo Printer, Intuit Quicken 2005 Deluxe for Mac with $20 mail-in rebate, Symantec Norton Utilities 8.0/Norton AntiVirus 9.0 Bundle, Symantec Norton SystemWorks 3.0/Norton Personal Firewall 3.0 Bundle, Aladdin Systems StuffIt Deluxe 8.0, SanDisk 256MB Secure Digital Card, and much more. ClubMac as money-saving deals you won't want to miss, including Intuit Quicken 2005 Deluxe for Mac, Iomega 12x Super DVD+/-RW Double Layer USB 2.0 External Drive with $30 mail-in rebate, ATI Radeon 9800 Pro Special Edition 256MB Video Card, Hyundia Electronics 17" Flat Panel Display with Integrated Speakers, Kingston 64MB Multimedia Memory Card, Canon PowerShot S1 Digital Camera, and much more. Publishing Perfection has great prices on publishing products for your Mac, including Adobe Creative Suite Standard Upgrade, Pantone/Colorvision SpyderPro with Optical with $30 mail-in rebate, Epson Perfection 3170 Photo Scanner with $25 mail-in rebate, SanDisk 512MB Compact Flash Card, Nik Multimedia Color Efex Pro 2, Extensis Suitcase X1 Upgrade, and much more. [8/12] OmniWeb 5.0 Final, a Cocoa-Native Web Browser Has Shipped: The Omni Group has shipped OmniWeb 5.0, a major update to the web browser designed to make your browsing experience more productive, more efficient, and more fun. The new version can be downloaded from The Omni Group's web site, and soon will be available in most retail software outlets. The new features include a tab drawer, saved browsing sessions, greatly enhanced bookmarks, page marking, improved search shortcuts, site-specific preferences, and more. "I'm really excited about the 5.0 release of OmniWeb, which adds features never before seen in any other web browser," said Ken Case, CEO of The Omni Group. "Now that we're based on Safari's fast and compatible WebCore engine, we've been able to spend our design and development effort thinking of new ways to save you time. For example, OmniWeb 5.0 is able to remember all of your open windows and tabs, so you can pick up exactly where you left off after upgrading your operating system. It remembers different settings--such as ad blocking--for different web sites, so you don't waste time switching your preferences back and forth as you browse. And that's just the tip of the iceberg: I encourage you to visit our website and give OmniWeb 5 a try for yourself!" OmniWeb 5.0 is available as a 30-day trial. Note the trial period includes 30 separate days, not just 30 launches. OmniWeb 5.0 sells for $29.95. Upgrades to OmniWeb 5.0 from previous versions are $9.95. [8/12] Mariner Software Announced Free Trial of Mariner Calc 5.3 Beta: Mariner Software, Inc. announced the public beta release of the long-awaited Mariner Calc, its award-winning spreadsheet for the Macintosh. Long touted as the only legitimate competitor to Microsoft Excel, Mariner Calc introduces the following features and fixes in preparation for the release of version 5.3. Updated the About box to Minneapolis office. Added new document icon for OSX. Changed printing and setup dialogs, several drivers crashed when using the sheet style windows. Added file extension support in the save dialog. Fixed several Excel import bugs. And several other bug fixes. Developed on the Macintosh platform since the late 80's, Mariner Calc is now available for download in its latest beta revision 5.3b1. This full-featured trial version requires Mac OS 10.2 or higher and can be downloaded free of charge. The shipping version will initially be offered in English and Japanese and sells for $69.95US. Upgrades will also be available for older version owners. Support for other language versions is expected in the near future. iSync lets you manage your contacts, calendars, To Do lists, and Safari bookmarks across multiple Mac OS X computers and devices (such as an iSync-compatible mobile phone, Palm OS device, or iPod), so you always have your most current information with you. To sync a Palm OS device, you need to install the iSync Palm Conduit version 1.2 or later. iSync 1.5 adds support for more devices such as the latest Sony Ericsson and Motorola phones. For more information about supported devices and connectivity requirements, visit www.apple.com/isync. Before you install iSync 1.5, you must install iCal 1.5.2 or later. To download the latest version of iCal, visit www.apple.com/ical, or use Software Update (in System Preferences) to install the latest version. If you are using Mac OS X version 10.3 and plan to synchronize a Bluetooth mobile phone, you need to have Bluetooth version 1.5 or later installed. To download the latest version, use Software Update (in System Preferences). If you have an earlier version of Mac OS X, visit www.apple.com/isync to download the appropriate Bluetooth version. Note that the Motorola cell phones still only sync via a USB cable despite the V600 being Bluetooth capable. iSync 1.5 downloaded and installed with no problem on a 17" PowerBook G4 but we have yet to run it on our .Mac account, SE T68i cell phone and iPods. Java 1.4.2 Update 1 provides support for JDK 1.4.2_05, improved behavior for applets in Safari, and increased stability for desktop Java applications. The system will be updated to Java 1.4.2 Update 1. If the system currently has Java 1.4.1, it will be removed. For more details on this update, visit this Apple web page. [8/11] Apple Pro Application Support v2.1 was Released: According to this Apple web page where the download is available, "This update provides improvements for Apple's professional applications, and is strongly recommended for all users of Final Cut Pro, Cinema Tools, Compressor, LiveType, Soundtrack, and DVD Studio Pro. This update improves general user interface appearance and reliability and is required to receive future updates for these applications." The DVD Studio Pro 3.0.1 update is strongly recommended for all users of DVD Studio Pro 3. In addition to improving general stability, this update improves compiling when using long MPEG-1 video clips, as well as compiling tracks with a transition on a still image at the end of the track. Additionally, burned DVDs will mount successfully on Mac OS 9, no longer requiring Command-Option-I. We could not get the "more info" article link noted in the Read Me file to work at publication time. [8/11] Macromedia Offers Free On Line Seminars: The topics of the seminars are: Getting Started with Dreamweaver MX 2004 and Getting Started with Cascading Style Sheets (CSS). These seminars are free, and attendees will be entered to win a copy of Dreamweaver MX 2004. They will take place on 8/24 and 8/31 and registration is from this Macromedia web page. [8/11] Foundation Mac OS X Web Development Published by Friends of ED: According to the publisher, it is a Mac focused new addition to their acclaimed Foundation series. It takes the reader to a position where they can really take advantage of what our Macs have "under their hoods." UNIX, Apache, MySQL, PHP and Perl are amongst the topics covered as the book takes the reader from working with simple static websites, through to dynamic ones making use of databases and server-side languages. This is all done with a distinctly Mac flavor. There are more details about Foundation Mac OS X Web Development, together with a sample chapter at the FoED web site. [8/11] Free Envision Web Show of the Week: According to Open Door Networks, further advancing its groundbreaking Envision application, Open Door Networks announced "Web show of the Week." Each week, on Tuesdays, Open Door will make available a free Envision "Web show." Web shows work with Envision to display images from particular Web sites outside the confining windows of traditional Web browsers. Web show files contain the URL (Web address) of the site, along with display parameters such as time between images, background color and transition effect. The first Web show of the week, available immediately from Open Door Networks, features stunning full-screen artwork created using fractals, self-similar mathematically-created objects. [8/10] Brief Hands-On Report--Mac OS X 10.3.5 Update: Late yesterday, Apple released Mac OS X 10.3.5 Update (Build 7M34) for clients and Mac OS X 10.3.x Server. It is available via the Software Update preference pane and as a standalone updater, the delta update (from 10.3.4) is here and the combo update (from 10.3.x) is here. The 10.3.5 Update delivers enhanced functionality and improved reliability for Mac OS X v10.3 "Panther" and is recommended for all users. We downloaded 10.3.5 via the Software Update preference pane and installed it on several G4 Cubes, Power Mac G5s, iBooks and PowerBooks running Mac OS X 10.3.4. The sizes of software updates can vary for computers running Mac OS X 10.3.4 or later. This is a feature of Software Update, which automatically detects the best update for your computer. So, no worries. The standalone delta file is 44 MB and the combo file is 88 MB. Description: This is for a situation where a web form is sent to a server using a POST method which issues an HTTP redirect to a GET method url. Using the forward/backward buttons will cause Safari to re-POST the form data to the GET url. Safari has been modified so that in this situation forward/backward navigation will result in only a GET method. Description: The "Rose Attack" describes a specially constructed sequence of IP fragments designed to consume system resources. The TCP/IP implementation has been modified to limit the resources consumed and prevents this denial of service attack. [8/10] Details on Apple's Security Update 2004-08-09: Apple released Security Update 2004-08-09 late yesterday for these system versions: Mac OS X v10.3.4 (Panther), Mac OS X Server v10.3.4 (Panther), Mac OS X v10.2.8 (Jaguar) and Mac OS X Server v10.2.8 (Jaguar). It is included in the Mac OS X 10.3.5 Update noted above. iPhoto 2.0.1 now supports AAC music files and provides notification when new versions of iPhoto are available. We have not found a standalone updater. The 10.3.5 Admin Tools Update installs updated versions of the Mac OS X Server v10.3 administration software. The web page was not working at publication time. CDW|MacWarehouse has fantastic prices on essential products for your Mac, including Avid Xpress DV 4, Intego VirusBarrier, Apple Final Cut Pro HD/LaCie 500GB Big Disk Bundle, Pantone ColorVision Spyder, Netopia Timbuktu Pro 7, Hewlett Packard OfficeJet 4215 All-in-One Device, Microsoft Office 2004 Upgrade Version, Edge DiskGo Pen, Canon i80 Color Bubble Jet Printer, and much more. Sweetwater has great deals on audio product for your Mac, including Digidesign Mbox Bundle, Tapco S-5 Monitor Speakers, Studio Projects C1, Antares AutoTune4, Bias SoundSoap, Universal Audio UAD-1 Project Pak, Spectrasonics Atmosphere, Etymotic ER-6 Earbud Headphones, and much more. [8/10] World-renowned Artist, Roger Dean, Released Desktop Series Three of Desktop Images. Continuing with his personal hallmarks of exceptional quality and extreme attention to detail as well as building upon the huge success of Desktop Series One and Two, Desktop Series Three provides yet another exciting journey into the famously artistic mind and one-of-a-kind style of Roger Dean. Roger's newest Desktop Series includes the stunningly beautiful pieces, Black Bat, Morning Dragon, Nitro Function, The Pier, and Spring, as well as fan favorites Flights of Icarus, Asia Pyramid, Aura, The Ladder, and Space Needle. Priced at only $9.95, Desktop Series Three comes in a variety of screen resolutions, including 1024x768, 1600x1200, 1680x1050, and 1920x1200. ABOUT ROGER DEAN: Roger Dean is an internationally acclaimed artist and designer whose evocative, visionary images with associated graphics, logos, and lettering, created a new genre of work. Made popular through the medium of album covers for artists such as Yes, Asia, Pink Floyd, Uriah Heep, Budgie, Osibisa, and others, Dean’s products, including posters, cards, books, and more, have sold in excess of sixty million copies worldwide. His best-selling books, “Views” and “Magnetic Storm,” have sold well over a million copies worldwide. Some of Roger Dean’s most famous works are now part of the permanent collection at the prestigious Victoria and Albert Museum in London. Visit www.rogerdean.com for additional information regarding Roger Dean. Under Repair History, readers reported on their experience with over 105,000 laptops and desktops. Out of eight manufacturers Apple scored best - fewest repairs/serious problems. Under Tech Support - Desktops, CR conducted two surveys. One involved 4,900 desktop computers. Readers scored Apple highest overall - 16 points higher than the nearest competitor - and gave it top ratings under all four categories of Solved problem, Support staff, Waiting on phone and Web support. No other brand scored as high in any category. Under Tech Support - Laptops, based on 4,000 laptops CR readers again scored Apple highest overall - 13 points higher than the nearest competitor - with top ratings in all three categories of Solved problem, Support staff, and Waiting on phone. [8/7] Maine Finally Gets Expansion of iBook Program to High Schools: We have been following this latest chapter in Maine's iBook saga since Gov. John Baldacci proposed that the legislature fund an expansion of Maine's Learning Technology Initiative to high schools. Over two years ago Apple won a contract with Maine's education department to provide iBooks to every seventh and eighth grader over two years and their teachers plus AirPort wireless networking, training and support. The program has been so successful that Gov. Baldacci wanted to expand it to the ninth grade in high schools so that graduating eighth graders could continue on in the program. He proposed using some "left over" capital construction funds but, unfortunately, the legislature had other priorities. In response, Maine's education department cut a tentative lease deal with Apple for $300 per iBook per year for four years if Maine's school districts ordered a minimum of 8400 iBooks. The deal also includes wireless networking, training and support as in the successful middle school programs. The best part is that the payment is not due until after the legislature comes back into session, giving them a chance to do right by Maine's high schools. Still, individual school districts have to risk paying the whole amount. iPhoto 4.0.3 addresses minor issues with Smart Albums and European books, and provides notification when new versions of iPhoto are available. This update addresses several issues with using multiple text rules in Smart Albums and it also eliminates some problems with creating iPhoto books in the German and Dutch languages. Additionally, 4.0.3 keeps users informed about new version of iPhoto that have become available. The descriptions of what's new are the same as those with iPhoto Update v4.0.2. However, some web sites posted complaints that iPhoto Update v 4.0.2 took a long time to launch and to shut down, occasionally hanging during shutdown. We didn't have those problems and v4.0.3 is not perceptibly faster at launching and shutting down than v.4.0.2. The main difference for us was that in v4.0.3 a dialog box popped up telling us it would take awhile to update our photo files and that afterwards we could not use them with a previous version of iPhoto. This dialog box, common to iPhoto updates, was missing in v4.0.2. [8/6] O'Reilly Released "GarageBand: The Missing Manual:" GarageBand may not begin with the letter i, but it's a glittering addition to Apple's iLife creative suite. It's a song-making toolkit and software recording studio that can produce professional-sounding, polished musical tracks. The program comes with 1,100 pre-recorded loops, tracks for live recordings, and effects like reverb and panning. But it doesn't come with a single page of printed instructions. "GarageBand: The Missing Manual" (O'Reilly, US $19.95) is the book that should have been in the box--and the manual that author David Pogue, a composer and former Broadway conductor, was born to write. [8/5] If Interested in Enterprise Process and Portfolio Management Software, Help Bring Digité to the Mac: Digité Inc., is a leading provider of Enterprise Process and Portfolio Management software for IT organizations and is evaluating the business opportunity to provide its products on the Mac OS X server and client platforms. Digité offers a solution for collaborative IT project delivery, whether software development, package implementation or legacy maintenance. Apart from traditional Task and Resource Management functionality, Digité also provides a suite of collaborative applications including Requirements Management, Change Management, Document Management and Test Management, among others. All this is available as a single integrated enterprise platform. Digité is evaluating the business opportunity to provide its products on the Mac OS X server and client platforms and is conducting a survey on its web site. If interested, please take a minute to complete the survey. [8/5] Apple Published "Universal Access: Computers That Everyone Can Use" which Includes a Look at Tiger's Implementation: Computers are becoming more usable by everyone, including those with disabilities. Apple has been adding technologies, features, and components that provide improved access to Macs for users with disabilities. The Apple Developer Connection's article describes the architecture of Universal Access on Mac OS X and what developers can do to make their applications fully accessible, plus it includes a preview of what's to come in the Tiger release. J&R has fantastic deals on a wide array of products for your Mac, including Adobe Photoshop CS Upgrade, eMedia Learn to Play Guitar Pack, Extensis Portfolio 7, Asypr Media Delta Force: Black Hawk Down, Brother MFC-8440 Laser Flatbed Multifunction Center, Fuji Film FinePix S5000 3.1MP Digital SLR Camera, JBL Creature II Speaker System, Microsoft Virtual PC 6.1, and much more. MacMall has great prices on essential products for your Mac, including Ran Design iLap Rest and Stand for PowerBook, Marware SportSuit for iPod mini, Ritek 4GB 52x Compact Flash Card, IMSI QuickStart Desktop Publishing Pro Deluxe, Tri-Synergy X-Plane, El Gato EyeTV 500, Eagle Games World Championship Poker, Viking 1GB USB 2.0 High Speed Portable Flash Drive with $150 mail-in rebate, and much more. B&H has huge deals on photo and video products for your Mac, including Alien Skin Image Doctor, Sony CyberShot DSC-P120 Digital Camera, Adobe After Effects 6.5 Professional, Nikon CoolPix 4200 Digital Camera, Canon Optura 400 MiniDV Camcorder, Sony DCR-HC30 MiniDV Camcorder with Accessory Kit, SanDisk 512MB Extreme Memory Stick Pro, Canon i80 General Purpose Portable Bubble Jet Printer, and much more. "Sony's Network Walkman NW-HD1 is as clunky as its name. The gadget looks great, but it's ruined by a bizarre insistence on a proprietary file format, a confusing navigation scheme and software that tries to be flashy but is incredibly frustrating." "And the Sony, which works only on a Windows PC and will be available later this month, costs $399. That's $100 more than an iPod which can run on either a Windows or Macintosh machine while providing the same 20-gigabyte music capacity." [8/5] Mozilla.Org Released Firefox 0.9.3, Thunderbird 0.7.3 and Mozilla 1.7.2: The updated web browsers and email client are available for download from this Mozilla Project web page. "These three new releases were created to correct 4 possible security vulnerabilities in past versions of each product." [8/4] New Virex v7.2 (.Mac version) Virus Definitions are Out. The new definitions may have been out for awhile since they carry the date of July 21, 2004, but the new definitions just popped up using the automatic eUpdate feature on our copy of Virex 7.2 yesterday. [8/3] Here's a List of Apple's Current Online Seminars: These online events, many free, are available 24 hours a day, 7 days a week from any computer with internet access. They are designed to be no more than 30 minutes in length and offer a wide variety of resources and information for your review. Perfectly Focused--Digital Photography on Mac OS X. This seminar will show you why you should take the plunge to digital--and how to get started with your own digital photography workflow on Mac OS X. [8/3] O'Reilly Released "Java 1.5 Tiger: A Developer's Notebook" and calls it a crash course in the next evolution of Java. The next version of Java, code-named Tiger, is more than just a minor update. With more than one hundred substantial changes to the core language and numerous library and API additions, developers will have a variety of new features, facilities, and techniques to master. Java 1.5 Tiger: A Developer's Notebook (McLaughlin and Flanagan, O'Reilly, US $29.95) is a no-nonsense guide by best-selling Java authors Brett McLaughlin and David Flanagan that sidesteps the dull prose and lecture and jumps right into the jaws of Tiger according to the publisher. [8/3] Maine High School iBook Program Expansion Hangs by a Thread: So far Maine's school districts have failed to sign up to a minimum order of 8400 iBooks that Apple required to implement the $300 per iBook per year lease program for expanding the iBooks to high schools. Currently, every seventh and eighth grader and their teachers have iBooks due to the highly successful Maine Technology Learning Initiative program. Gov. John Baldacci spearheaded an effort to expand the program to the ninth grade so that graduating eighth graders could continue with the lauded program in high school. The Maine legislature, citing other priorities, recessed without funding the expansion. But Apple and the Maine Department of Education stuck a rental deal of $300 per iBook per year with payment not due until the next legislative session. Gov. Baldacci asked school districts to sign up and he promised to fight for funding before they had to pay. [8/3] Keyspan Updated It's USB Server Software to v1.1: Keyspan's USP Server works with Macs or Wintels. Much like a USB print server, the Keyspan USB Server enables attached USB devices to be used and shared by client computers on a LAN. In addition to printers, the USB Server supports other USB devices such as scanners, hard drives and more. The USB Server provides 4 ports for connecting to USB devices at Full Speed USB (12 Mbps). It connects to 10/100 Ethernet networks via an RJ45 connector and supports static IP, DHCP, and Apple's Rendezvous address assignment. Macs need Mac OS X 10.2.8 or higher. The 1.1 software update offers broader device compatibility as well as a more convenient user interface. The Mac v1.1 software update is free of charge and can be downloaded from Keyspan's web site. MacConnection has great deals on essential products for your Mac, including the Nikon D-70 Digital SLR Camera with Nikkor Lens, Trilite 80S Digital Lighting Kit, Creative Labs iTrigue L3450 Speaker System, Griffin iTalk iPod Voice Recorder, M-Audio Oxygen 8 25-key Mobile USB MIDI Controller, Canon CP-200 Photo Printer, Macromedia Contribute 3.0 Upgrade, and much more. Inside Mac Games has great prices on the hottest games for your Mac, including Harry Potter Deluxe Edition, Medal of Honor: Deluxe Edition, Shrek 2, Adrenaline Sports Pack, XIII, Space Colony, James Bond 007: Nightfire, Battlefield 1942, Delta Force: Black Hawk Down, and much more. [8/2] Apple CEO Steve Jobs had Successful Cancer Surgery according an email he sent on Sunday from his hospital bed to company employees using a 17" PowerBook and AirPort Express. Jobs underwent cancer surgery for a rare form of cancer of the pancreas organ, an islet cell neuroendocrine tumor. It responds to surgery if caught early without needing radiation or chemotherapy. Jobs stated that, fortunately, the cancer was caught early enough. He does not have the more common and deadly adenocarcinoma form of pancreatic cancer. Jobs will recuperate for the month of August during which Tim Cook, executive VP for worldwide sales and operations, will lead Apple Computer. Jobs did not mention Pixar. I have some personal news that I need to share with you, and I wanted you to hear it directly from me. This weekend I underwent a successful surgery to remove a cancerous tumor from my pancreas. I had a very rare form of pancreatic cancer called an islet cell neuroendocrine tumor, which represents about 1 percent of the total cases of pancreatic cancer diagnosed each year, and can be cured by surgical removal if diagnosed in time (mine was). I will not require any chemotherapy or radiation treatments. The far more common form of pancreatic cancer is called adenocarcinoma, which is currently not curable and usually carries a life expectancy of around one year after diagnosis. I mention this because when one hears "pancreatic cancer" (or Googles it), one immediately encounters this far more common and deadly form, which, thank god, is not what I had. I will be recuperating during the month of August, and expect to return to work in September. While I'm out, I've asked Tim Cook to be responsible for Apple's day to day operations, so we shouldn't miss a beat. I'm sure I'll be calling some of you way too much in August, and I look forward to seeing you in September. PS: I'm sending this from my hospital bed using my 17-inch PowerBook and an Airport Express.